I'm not into boycotts. Maybe just because our family enjoys the Disney experience too much. So, I got a little wary when I heard Christians are talking about boycotting this new movie. 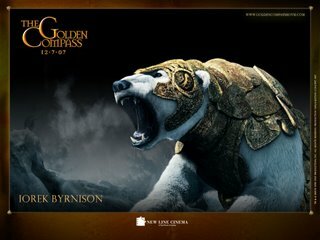 Some friends of mine even started a group on Facebook called, "Don't Boycott The Golden Compass" because of their frustration with believers who seem to run scared every time someone uses the word "athiest." However, I'm also the parent of children to whom this movie seems to be targeted, and I get a little protective when someone intends to tell my children that God isn't real. How do we live "in the world, but not of it?" How do we engage culture rather than separate ourselves from it? How do we teach our children and remind ourselves that there is only one enemy and he doesn't live in Hollywood? I do think extra caution is in order with children regarding film & music because the medium is so powerful and stirs both cognitive and emotional responses. At the same time, I strongly believe that we're here to influence the culture, not hide from it—and I want to teach my children to do the same. From an early age they need to learn the skill of discernment, and that means that sometimes I might allow them to be exposed to something so we have the opportunity to dialogue about it. I want to create an environment in my home where my kids realize that it's okay to ask questions about God and faith. I want my kids to know that God isn't threatened by those questions, and neither am I. You don't have to spend $8.50 to have that conversation—we have so many other opportunities to engage our kids—maybe we can talk about the atheist that lives next door and how best to love him instead of the atheist that lives 2000 miles away and made a movie. As for the Golden Compass, I don't know. I do want them to learn to exercise their discernment muscles early. Probably, if anything, I'll watch and discuss it with Stephanie before allowing the kids to see it. What will you do? Comments welcome!